We have reached that midwinter lull when the holidays are behind us and the days are still too short, the nights still too long. Snow and ice are everywhere in this part of Montana so I worry about people slipping. Lynda’s wrist is finally healed although she hasn’t gotten back to quilting a lot yet. Bev’s husband, John, was in the hospital for a piece and than last week we missed Bonnie because she was laid up. There’s something about winter that just makes everyone seem more vulnerable. And yet even as we tread carefully through the snow to get to the old school house, once there everyone settles into laughter and stories, drinking Joan’s coffee and nibbling the shortbread cookies she brought us. We finished up one quilt and are putting another one on next week. The beautiful one with tropical colors is still the one that I enjoy working on at the moment. It gives a sense of warmth and sun during this winter season. The hot coffee and cookies are a treat as is the quilt with its shades of oranges and reds but as always its the people that draw me to the school house on Fridays. 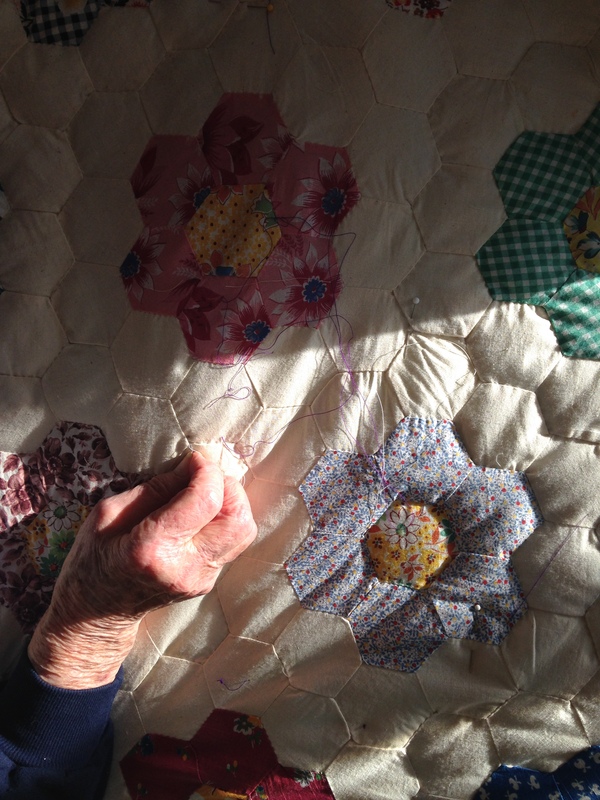 Judy showing us the lovely miniature quilts that she made. Carmen bringing homemade tamales to share. Lynda trading a knitting pattern for a hat. Cathryn giving me a bag of books for my dreamed of used bookstore. The relationships. That’s the magic of Fridays in the Historical Village. Visitors stop by to drop something off or to ask about getting a quilt done and they are all warmly welcomed. Or a tourist might come in even during this time of year to see what’s going on and we take turns explaining how we quilt to raise the money to maintain the Village. And when the guests all leave and we settle back around the quilting frames, that’s the time when we listen to each other, tell about a woe or a challenge or some funny story about the grandbaby. That’s the magic. Old dogs and new tricks. I’m all about it. Took a Twitter tutorial over the holidays. Recently Rob at 221Dewey Graphics showed me how to do panoramic shots with my phone. Of course Joan, one of the quilters, sets a higher bar for us all; in her 80s and running a very active eBay business.